Whether you're a professional landscape artist or a home gardening enthusiast create your dream project by choosing from our massive range of pots, pavers and wall art. The largest selection of pots, pavers and water features on the Central Coast. 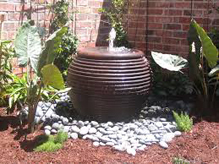 Turn a pot into a water feature. All the "Hard Fired" brands such as Atlantis, Ocean Rock and Glazed are suitable. The House of Paving and Pots carries a wide range of water pumps and accessories, bases and fountain fittings for all sizes and styles to achieve the desired finish of the client's needs. Go ahead and design your own or just browse our many varieties and styles on offer. Nothing is more relaxing than the sound of moving water in the garden. Contact us to find out how to build a unique water feature over a weekend.